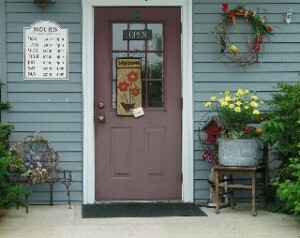 Loose Threads is the Area’s Largest Quilt Shop in Southern WI. We are conveniently located six miles off Interstate I-90. Take Hwy 26 north toward Milton. Turn off onto exit 8 and go West into Milton. At the stop light turn right and proceed on Business 26/Janesville street approximately 2 miles. We are located north of the city on the left side of the road. Look for the white gazebo. Our building is rich in history. Built in 1852 as a one room schoolhouse, you will be sure to enjoy the historic atmosphere. Following years led to expansions of the building, thus allowing us to offer our customers a wide variety of goods. View the bright room, homespun room, baby area (consisting of flannel, cuddle, and 100% cotton), an extremely large selection of Northwoods, brights, and floral flannels along with over 7000 bolts of fine 100% cotton. Our newest addition which was completed in January, 2011 gives you another 1,500 square feet of shopping area that features hundreds of bolts of batiks, flannel, and just added-civil war fabrics! If you enjoy applique you will be rewarded with the extensive variety of samples and patterns we have to offer. We carry fabrics made by Moda, Maywood, Avlyn, Blank, Andover,Windham, Timeless Treasures, and many more. Newly added hand dyed wools and Valdani pearl cotton will keep you in awe along with the gallery of samples we have to offer. We are also an authorized PFAFF dealer! This atmosphere combined with the gallery of quilt samples is sure to expose you to a variety of quilting experiences. Stop in, relax, and enjoy the many goods we have to offer! “Samples are Us!” Stop in and see for yourself. No charge for inspiration.